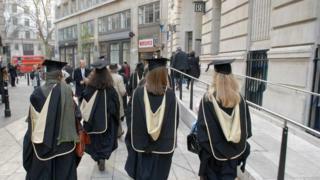 London has retained its title as the world's top university city, with four institutions in the top 40 of the latest ranking. The London School of Economics rose from 71st in the 2014 QS World University rankings to 35th this year. University College London was rated seventh, Imperial eighth and Kings College London 19th. "London is unequivocally the education capital of the world," said the city's Mayor, Boris Johnson. Other top university cities include Boston and New York, with three universities each in the top 50, and Paris, Sydney, Hong Kong and Beijing, each with two. QS says it has changed its methodology slightly this year to counteract a bias in favour of universities specialising in life sciences and to better reflect the qualities of institutions focusing on other areas. This has helped London School of Economics improve its position and "to be counted, rightfully, amongst the world's top 40", according to QS head of research Ben Sowter. LSE director Prof Craig Calhoun described the ranking as "an outstanding result for the school, its staff and our students". "It reflects both LSE's longstanding global leadership in social science and its continued creativity," he said. The change also benefited Warwick and Durham universities, in 48th and 61st places this year, up from 61st and 92nd last year. Durham's vice-chancellor Prof Stuart Corbridge said he was "proud and pleased" the university had scored so well, "demonstrating the impact and influence of our research amongst the global academic community". Massachusetts Institute of Technology was rated the world's top university, followed by Harvard in second place, with Stanford and the University of Cambridge in joint third place. The University of Oxford was in sixth place, behind California Institute of Technology in fifth. Of the 34 nations in the top 200, the US is dominant with 49 institutions, ahead of the UK with 30, the Netherlands with 12, Germany 11, Canada, Australia and Japan with eight each, China with seven and France, Sweden and Hong Kong with five each.